Quarantine is a game by Mark Klassen and it would appear to be his first foray into board game design. That is the main flow of the game until the game ends. Of course if it were only this, then the game would be quite boring. The way the game remains different and interesting is the type of special tiles that are available in each game. There are 14 types of special tiles in the game, of which only 8 are used per game. The special tiles give you certain abilities that help you to bend the rules of the game. I like games that give me something that I can build up through the course of the game. Its nice to have your own little paradise, and that also means that each game can be as different as I want it to be as I can decide for myself how my hospital will be built up. I love abilities in games. Even more so when it is something that has to be fought over for so that you have the right to use it. Sometimes it is frustrating but that adds another element to a game where you decide how much you think an ability is worth to you and to those who might upend you for it. The Art style is right up my alley. It may be too kiddy for some but that’s how I like most of my art for games. Cartoonish art is much better than realistic art IMO. The theme of running a hospital also appeals to me as I played Theme Hospital to death when I was still into Video Gaming. The open tile contract mechanic is supposed to be interesting in a sense that you can only place a price that you can afford ( based on the colored cubes you have ), but you aren’t able to purchase it till it comes round to your next turn. Basically, everyone is allowed to purchase it before you as long as they can afford it. So you are supposed to open a tile that maybe you didn’t really want and hope others open one that you want, or place a price that others cant afford. It doesn’t really sound like something I would like to be doing in a game I must say. It is indeed different than what you find in most games, but its not an interesting different for me. I think it would end up to be rather frustrating. What compounds on the open tile contract mechanic is the fact that each special tile only has 2 copies of it. So once you put it up for grabs, if 2 people buy it, then that’s all for the rest of the game. In a 3 player game this is still bearable, in a 4 player game, wow, the chances of it being gone might be high. I don’t know but I think it makes the open tile bidding very irritating to me. In Quarantine, when you draw a disease cube, you may simply add it to any player’s hospital without reservations. So everyone could possibly gang up on one person. I am not opposed to ganging up on someone, but when you can do it just because you managed to draw a disease cube, well, there’s no cost to you there, so it makes it very unfair in a way. I am not opposed to games where the mechanic involves pulling stuff blindly out of a bag, but it has to have at least some form of control over it. Like in Thebes, you can plan in a way to draw more tiles and thus have a higher chance of getting something good. But in Quarantine, it seems like you just draw 4 each turn and let the favor of the Gods be bestowed upon you. It could be a small thing really, but the fact that the type of cubes and the order that they come in is important, having it drawn randomly with no inherent way to at least influence a part of it seems maybe a bit too random for my liking. 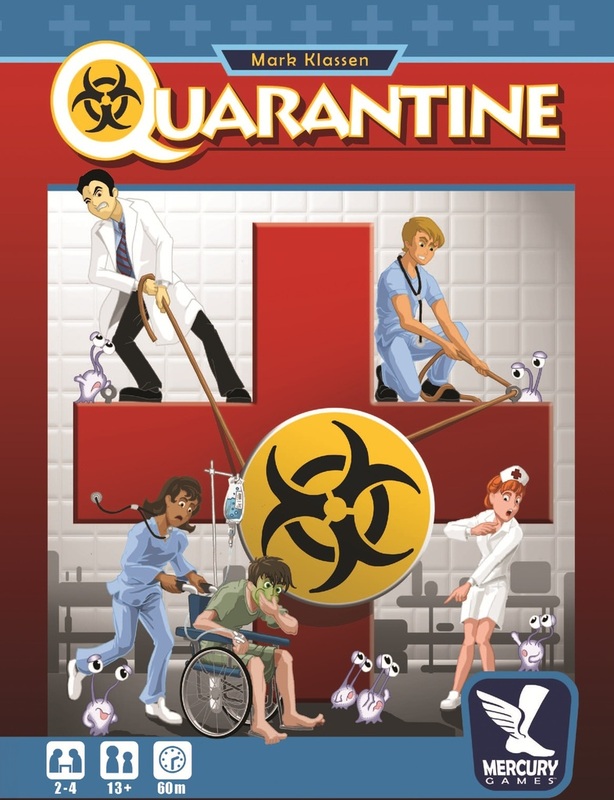 I was really excited when Quarantine was first announced. I had it high up on my want list and was looking forward to more news being released. But after my dissection of the rule set, I am not so sure that it will be a game that is right up my alley. I still have an eye out for it, but I will want to play the game to see how the ebb and flow of the game is like and whether the Open Tile Contract mechanic works or if it indeed plays out to my frustrations. basically the idea of "A Purchase Decision" is just to state out what i thought of while deliberating whether or not to buy a particular game. i'm not sure how each of you decide on what game to purchase ( art, newness, designer, etc etc ), but for me, each purchase goes through a very vigorous and tough selection process, which usually also includes the reading through of the rule-set.